Originally hailing from Sunderland, Keith Bradbury's early interest was in white water and sea canoeing. After spells of trekking in Nepal and canoe guiding in France, a teaching job in Kendal dictated that the Lake District would be his next playground. Walking and rock climbing then became his new passions, until a chance introduction to caving led to a rekindled love affair with the Yorkshire Dales and his heart was lost forever! The last 20 years have been a delightful exploration of those secret, hidden places, either underground with helmet and lamp, or above, on his (t)rusty mountain bike. 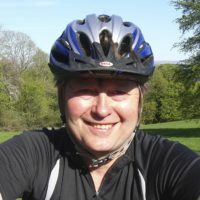 Keith is a member of the Outdoor Writers and Photographers Guild and prides himself on an unrivalled knowledge of the bridleways of the Lake District and the Northern Dales.